- Making fajitas and having an awesome dinner picnic on the beach with friends. I made tortillas from scratch with nothing but a 3-4 inch tall glass supplements bottle (empty of course) to roll them out with, it was nuts! On the beach we had the fajitas, bought fruit from the children who come and sell things to you, and we got to try authentic Empanadas made by Mike's Argentinian co-worker Maxi. The kids were really funny and wanted to try the juice Maxi brought, and he shared with them as they talked in Vietnamese and we had no idea what they were saying, Michael had a blast playing with them. - Crazy huge jellyfish on the beach. The other night we went walking on the beach after high-tide and there were HUGE jellyfish washed up on the beach, like 1-2 feet in diameter at least. We felt bad because they could be alive still, but when we tried to move one with a piece of styrofoam the jellyfish was so heavy it just broke the foam to smaller pieces. This is a fun one, even though it's scary. My first encounter with rush hour was a crazy experience. Every day, the main bridge by the tower where Michael works, Son Han Bridge, closes to cars and trucks for a few hours in the morning and a few hours in the afternoon. I found out why when I tried to cross said bridge about 5PM one day. There is a large roundabout (circus outside of UT/US) right in front of the street that crosses the bridge, and as I approached from the opposite side as the bridge the entire area was full of motorbikes, more than I had ever seen in one place before. This crowding comes from a cultural aspect I describe in the next list - but anyhew, there were so many people because they had closed the bridge to only go one way for a while to alleviate traffic on the other side, so on our side traffic was just piling up, literally. It looked like a waterfall of motorbikes coming across the bridge, hundreds and hundreds of people, and I was in the middle of more hundreds, bumper to bumper, ankle to ankle all the way around me. I finally got to cross the bridge and I became a part of the massive waterfall, just scooting along with my feet slightly off the ground, hoping my foot didn't get run over by the person next to my and trying to keep up with the person in front of me so my space doesn't get taken by someone else. IT IS INSANE. The thing I don't like is the massive cloud of exhaust you are breathing the entire time, but ultimately, I find it exhilarating, despite all rational thought. I don't drive through the mass very often, but it is almost fun sometimes (but definitely not in the rain). 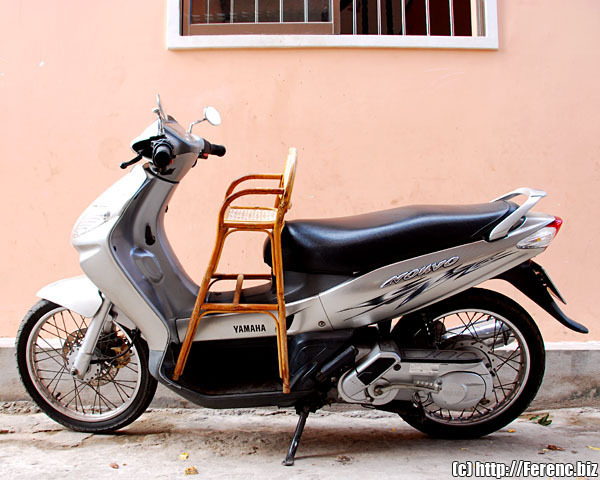 - The crazy things people carry on a motorbike. - A guy carrying a large birdcage as tall as he was sitting on the bike, he just had one hand in the cage and used the other to drive. - Cases of beer/bottles stacked 5-6 high - with no straps. - Another motorbike - yes, really. 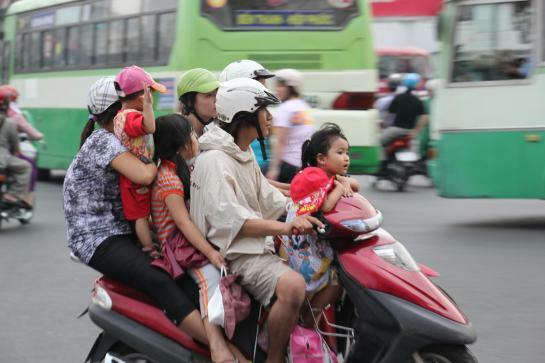 - Tons of children - a Vietnamese car seat looks like this (click for the link), sometimes they have little harness like things that strap kids to the adults, but a lot of times it's just the parents holding the kids or sandwiching them on the bike (also click on the phrase for the link). - Men and children peeing anywhere and everywhere. Yes, kids pee everywhere, in the grates in the basements of buildings, on the sidewalk, on the street, etc. And so do the adult guys. Any grass or fence is fair game to the weary motorcyclist who needs a bathroom. The other day I actually saw a guy peeing while he was crossing a busy street - I'm just glad I didn't see anything specific, ewww. Coming from a desert, I have really realized how much I am not used to bugs. 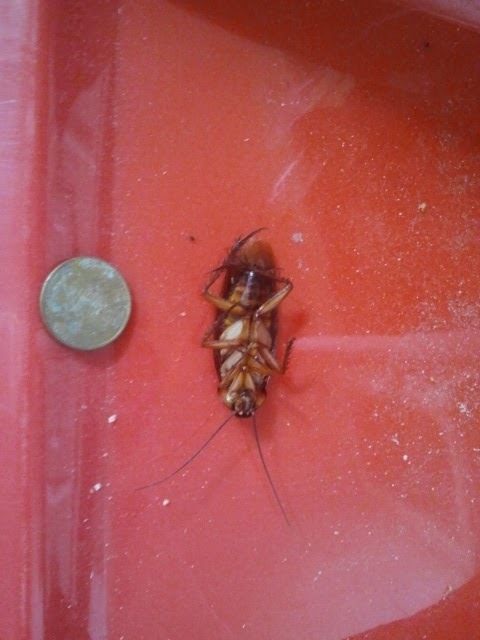 Roaches were a nasty surprise, but I think I hate mosquitoes more. We have at least 2 different kinds of mosquitoes, small ones and big ones, the big ones have stripes, and I react to one of them a lot worse than the other. I get raised hives about 3-4 inches across and they last for a week, my legs look like I've had the measles. And when you start allowing any spiders to keep residence in your house regardless of their potential to be poisonous, you know you really hate mosquitoes. Here's a photo of a roach we found in the kitchen a month or so ago, the coin is about the size of a nickle to give you perspective. Culturally, Vietnamese people don't line up for anything, anywhere. The common thought seems to be if you squish in further or around more, you'll get there faster. Such is the case during rush hour, where a few hundred motorbikes turn into the biggest funneling effect you've ever seen, where people will drive on the wrong side of the road just to get around the person in front of them. Such is also the case with elevators, lines at the supermarket, etc. etc. If you want to stand in line and "wait your turn" like we do back home, you will be waiting a long, long, time, if your turn ever arrives. It's really fascinating at times, but it can be quite annoying too. In the end, some days have more good things, and some days seem to have more bad things, but we have had a crazy bundle of experiences over the past 3 months, and we are grateful for all of them. Amazing! All of it. Really. It's like you are living in a completely different world. The "no lines" thing fascinates me. It's just how we do things here so I've never really even given it much thought. 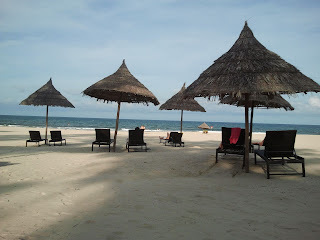 And from everything I've read on your blog, I gather you never walk anywhere barefoot in Viet Nam. Like ever.